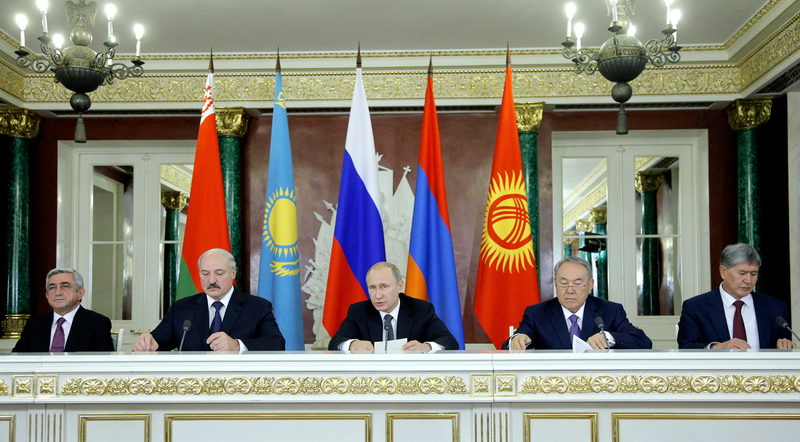 Armenia's President Serzh Sargsyan (L-R), Belarus President Alexander Lukashenko, Russia's President Vladimir Putin, Kazakhstan's President Nursultan Nazarbayev at the meeting of the Eurasian Economic Union in Moscow, 2014. At present the talks on creation of free trade zones with Serbia and Israel are ongoing. Presidents of Russia, Kazakhstan, Kyrgyzstan and Armenia have approved proposals on the need to start talks on creation of the free trade zone between the Eurasian Economic Union (EAEU) and Iran, Egypt, India and Singapore, Chairman of the Board of the Eurasian Economic Commission Serzh Sargsyan told reporters. "The presidents of four countries have approved the proposal that it is necessary to launch negotiating process (on creation of free trade zone - TASS) with Iran, Egypt, India and Singapore. That means that already on the platform of the EuroAsian commission we will start an intensive process of preparation of signing agreements with those countries," he said. Head of the board added that the presidents had instructed their government to create working groups that will take part in the negotiations as well as to appoint officials responsible for the talks. Sargsyan reminded that at present the talks on creation of free trade zones with Serbia and Israel are ongoing. Also talks on trade and economic relations have been launched with China, he said. The head of the board said that during the meeting of Supreme Eurasian Economic Council the Presidents of EEU discussed 25 issues. The first group of issues concerned foreign economic activities of the Eurasian Union, the second set of issues related to the activities within the Eurasian Economic Union. In particular, the leaders adopted a declaration on formation of (digital agenda) of the EEU. They also adopted documents on establishing a common electricity market within the Union. According to Sargsyan, this will liberalize electricity sales between the countries. The parties also approved documents for liberalization of services and on establishment of transport market. The leaders of the four countries have signed the new Customs Code of the Eurasian Economic Union, although Sargsyan said earlier that Kyrgyzstan had not signed the document. In conclusion, the head of the board said that the presidents of the four countries have ordered to present all the documents they signed at the meeting to Belarus President Alexander Lukashenko who was absent at the meeting.